Pressure washers have many uses around the home. They can also be a helpful tool for many professionals. A pressure washer can be used to remove old, chipping paint from different surfaces. They can also be used to clean decks and patios. Many pressure washers are powerful enough to remove stubborn dirt and debris that has been accumulating for years. They can add beauty to your home and can also make your business more attractive to your customers. There are different pressure washers available depending on the needs you have. A high powered pressure washer with a high PSI is ideal for professionals or homeowners who need a powerful machine to remove heavy dirt and grime. If you plan to use it for basic maintenance around the home, a smaller machine may be all you need. The following are the top 10 best electric pressure washers based on consumer report. 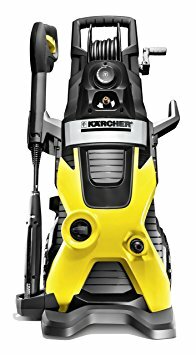 The Karcher K5 pressure washer is powered by electricity. This unit is priced at around $220. It has 2000 PSI to quickly and thoroughly clean many different surfaces. 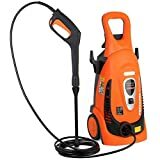 This pressure washer has a spray wand that is designed to be easily adjusted while holding the wand. It also comes with a 25 foot hose. The dirt blaster spray wand that is included with the Karcher K5 pressure washer can remove even the toughest dirt and grime in less time than many other pressure washers. It has a maximum water temperature of 104 degrees. This unit is designed to remain free of corrosion and is relatively maintenance free. 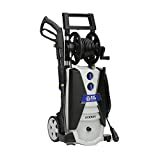 The Ivation electric pressure washer is priced at around $150. It has an 1800 watt motor that can provide enough power to clean many different items around the home. It has maximum scrubbing power to remove tough dirt and grime. It also comes with 5 interchangeable high and low pressure nozzles to clean different surfaces. This pressure washer has copper connections that join easily together for quick hookup. It features an automatic stop system, self suction, and a soap dispenser. The system includes everything you need to set up and begin pressure washing around your home. The AR Blue Clean pressure washer is priced at around $160. This machine works well for decks, patios, recreational vehicles, home siding, and more. It comes with a 30 foot hose and a 35 foot power cord, making it easy to use all around the outside of your home. 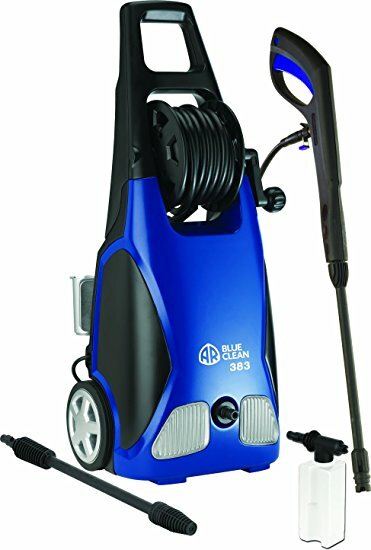 This electric pressure washer from AR Blue Clean has several attachments that make it functional for many different jobs. It comes with 4 different nozzles that are designed to work for different tasks. It also comes with a large capacity detergent tank and a professional style pressure washer wand and gun. The unit is easy to assemble and can be used within a few minutes of removing it from the box. 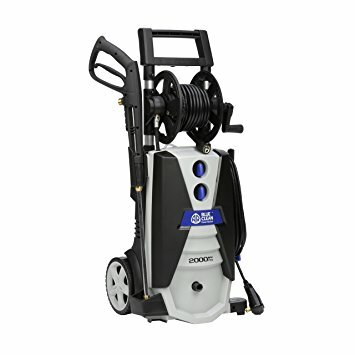 This electric pressure washer from AR Blue Clean is priced at around $117. It allows you to clean many different surfaces around the outside of your home. It can be used for driveways, outdoor furniture, and vehicles. This pressure washer is designed to conserve water and use 80% less water while providing 40% more pressure than other similar machines. This budget-friendly electric pressure washer is quieter than gas models and can be used without worrying about disturbing the neighbors. It comes with a professional style wand and gun along with other accessories to making cleaning easy. The 1700 PSI pressure washer from Karcher is priced at around $135. This machine comes with a convenient food pedal that allows you to turn it on or off easily. It also has a large bin for storing attachments and accessories. This machine works well for many outdoor uses and can clean home siding, outdoor furniture, patios, and more. The Karcher pressure washer has 3 nozzles designed for different types of cleaning. It comes with all metal hose connections and a heavy-duty frame that is designed to last. This machine has a nozzle designed specifically for use with detergent and it has a removable detergent tank for convenience. 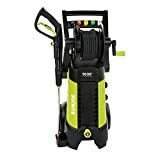 The Sun Joe pressure washer is priced at around $170. It has pressure select technology so that you can customize the pressure based on cleaning needs. This machine has a powerful 14.5 amp motor that is able to deliver excellent pressure for even the most difficult cleaning jobs. The wheels on the machine make it easy to move around while you’re cleaning. 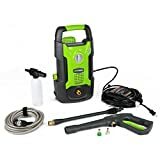 This pressure washer from Sun Joe comes with 5 spray tips that are easy to connect. It also comes with an extension wand and 20 foot high pressure hose. It has a garden hose adapter and comes with a needle clean out tool to remove any dirt or debris. The Karcher K3 Follow-Me pressure washer has wheels so that you can roll it behind you as you’re cleaning. This unit is priced at around $135. It has the ability to produce up to 1800 PSI for many different cleaning jobs. 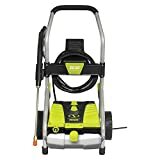 This is the only rolling pressure washer on 4 wheels available on the market and the unique design makes it easy to use. This pressure washer from Karcher has an onboard tank for cleaning with soap and detergent. It also comes with a Dirtblaster spray wand that can remove tough dirt and debris from many surfaces. The N-COR pump is designed to be durable and is made from non-corrosive materials. 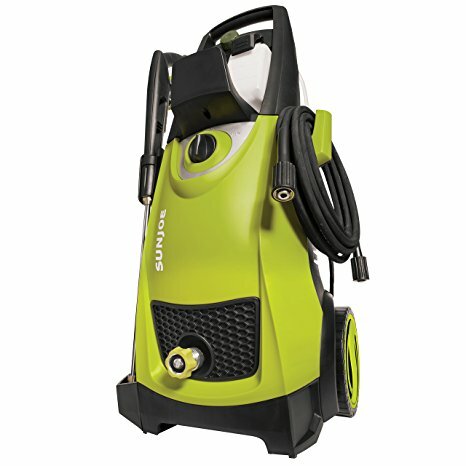 The GreenWorks electric pressure washer is a small and compact unit that is ideal for light jobs. It provides 1500 PSI. This machine can be used vertically or horizontally depending on cleaning needs. It has two quick connect tips that are designed for use with different cleaning applications. 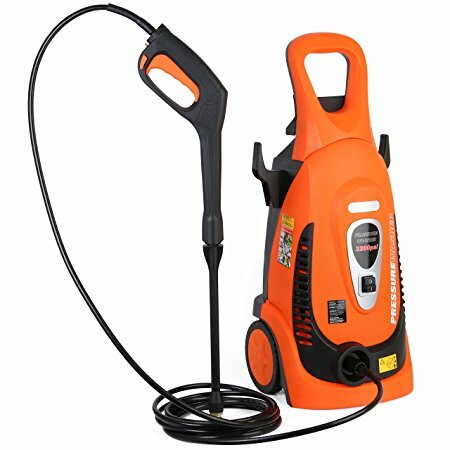 This small pressure washer comes with a soap applicator for use with different types of cleaning products. It also has a 35 foot power cord with inline GFCI for use with outdoor outlets. This machine comes with a 20 foot high pressure hose that allows you to clean vehicles, outdoor furniture, and much more. This pressure washer from Sun Joe is priced at around $180. It comes with 5 quick connect spray tips that are designed to tackle different cleaning jobs. This machine also has an onboard reel to keep the 20 foot hose tangle free and always ready for use. The powerful motor can generate up to 2030 PSI for even the toughest cleaning jobs. The Sun Joe pressure washer has a system that stops the pump when the trigger is not engaged. This helps to conserve energy and reduce wear and tear on the pump. This machine can be used for many different cleaning jobs like cleaning vehicles, outdoor furniture, and patios. This option from Sun Joe is priced at around $140. It has a powerful 14.5 amp motor that is able to deliver excellent pressure for tough jobs. It also comes with 5 spray tips that are easy to connect and are designed to be used with different jobs based on cleaning needs. This pressure washer automatically shuts off the pump when the trigger is not engaged to protect the pump and save energy. The Sun Joe SPX3000 comes with dual detergent tanks. The tanks are removable for easy filling. This allows you to keep 2 different kinds of detergent on the machine if needed. 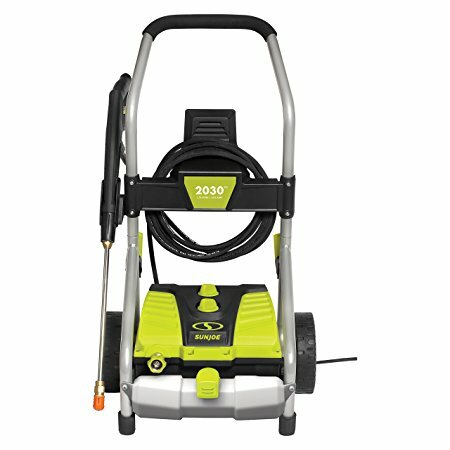 This pressure washer can provide up to 2030 PSI to tackle light, medium, or heavy cleaning jobs. A pressure washer has many uses for homeowners and professionals. They can be used to clean sidewalks, patios and decks. Pressure washers can also be used on outdoor furniture or other items to prepare them for painting or staining. A quality pressure washer can be easily moved around so that you don’t have to struggle with the machine while trying to clean. Many are lightweight and they have long hoses and power cords for convenience. When you’re shopping for a pressure washer, it’s important to consider the PSI. A higher PSI means better cleaning power for tough jobs. It can be helpful to read reviews from other customers who have used the machine. This objective information can help you find a pressure washer that works well in removing even the toughest dirt and debris.